Cowabunga Bay Water Park offers Nevada’s most thrilling one-of-a-kind water slides and attractions at this 23-acre water park located just minutes from the strip. Cowabunga Bay Water Park offers Nevada’s most thrilling one-of-a-kind water slides. Cool off with a variety of attractions at this 23-acre water park located just minutes from the strip in Henderson, Nevada. With a variety of things to do, this super clean and fun water park is the perfect place to go for the whole family. 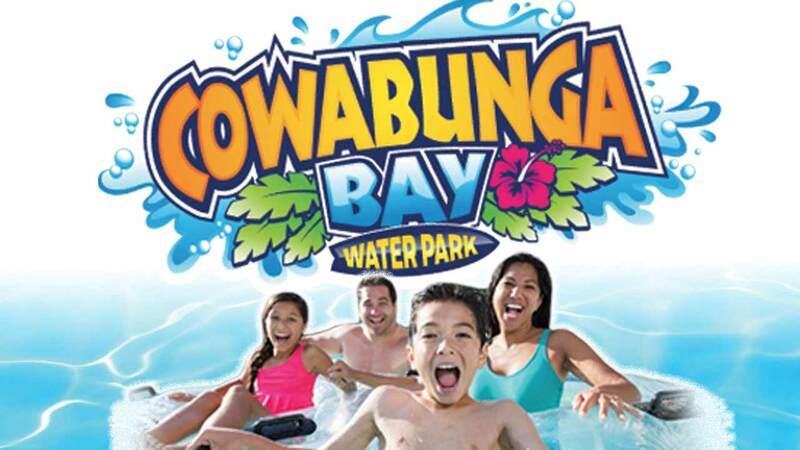 With top-notch friendly staff and lifeguards on duty at every ride, slide and water spot, you will enjoy summer fun any time of year at the Cowabunga Bay Water Park. Scream with delight on thrilling water slides or float along the lazy river, either way you and the family will have a great time. The major water slides and attractions include Beach Blanket Banzai, their extreme multi-person raft ride that can carry up to four riders up a conveyor for 60 feet where you then race along with 180 degree turns, not to mention a few drops along the curvy way. On Breaker 1-9 you will race down at high speeds on this wild water slide. Make sure to jump into Point Panic, where you will grab a tube for this totally enclosed, pitch-black water slide. Rock-A-Hoola is their infamous bowl drop where courageous riders will barrel down a long slide before they get into a giant bowl and are then propelled through a few revolutions, ultimately taken into a full-on splashdown. On Surfin’ USA you can race head first going against up to 5 other riders or on Surf-A-Go-Go-On you slide into two huge rebound chambers, leaving you deliriously drenched. Don’t forget about Zuma ZOOMa which drops riders from over 70 feet up in the air to a 360-degree loop using a launch capsule and trap door. After all that excitement don’t forget to just enjoy the Cowabunga Lazy River with its retro themed surf scene, and the Surf-A-Rama Wave Pool, which has a cool,1950’s Drive-In theater beach vibe. For a more relaxed moment, enjoy the Boardwalk Bay, which offers a regular pool to chill out in. The Cowabunga Kids Cove has been designed exclusively for toddlers and young children so they have a place their size to splash and play in, with kid-friendly pools and slides. And make sure to check out the arcade, which is the perfect place to cool off on a hot day, with its air-conditioned location in the park.There are cabanas and lockers for rent so you can plan to spend the whole day here or even do a half-day excursion. There are also lots of options for food including being one of the rare and exclusive places outside of Disneyland’s Tiki Room that carries Dole Pineapple whip! Enjoy this delicious treat or other classics like churros or funnel cake and make sure to grab freshly made ice-cold lemonade to go with it. Bullwinkle’s Grille serves Buffalo wings, pretzels, nachos, their signature bucket of fries, burgers, sandwiches and wraps. Tubes and Lifejackets are always free plus they provide tubes free of charge at the Lazy River and Wave Pool, making Cowabunga Bay Water Park the perfect place to escape the Vegas heat.